Mars is about to come into 3D focus as never before thanks to the data from Mars Express's High Resolution Stereo Camera (HRSC). A new high-resolution Digital Terrain Model data set that is about to be released onto the Internet, will allow researchers to obtain new information about the Red Planet in 3D. Digital Terrain Models (DTMs) allow scientists to ‘stand’ on planetary surfaces. Although ordinary images can give spectacular bird's-eye views, they can only convey part of the picture. They miss out on the topography, or the vertical elevation of the surroundings. That's where Mars Express comes in. The spacecraft's High Resolution Stereo Camera (HRSC) was especially designed to provide this information and, after years of specialised data processing, the first comprehensive release of 3D data of a large part of the martian surface is now ready. “Understanding the topography of Mars is essential to understanding its geology,” says Prof Gerhard Neukum, Freie Universität (FU) Berlin, Germany, Principal Investigator for the HRSC. The image shows an ortho-image mosaic of Olympus Mons with superimposed colour coded elevations. Olympus Mons was imaged by the High Resolution Stereo Camera (HRSC) instrument during 18 Mars Express orbits. 16 HRSC orbit strips, with around 35 Gigabytes of image data were used to generate a digital terrain model (DTM) mosaic with a map resolution of 150 m per pixel as well as a gapless ortho-image mosaic covering an area of approx. 600,000 km². The map scale for the nadir images are in the range of 12 m to 40 m per pixel. 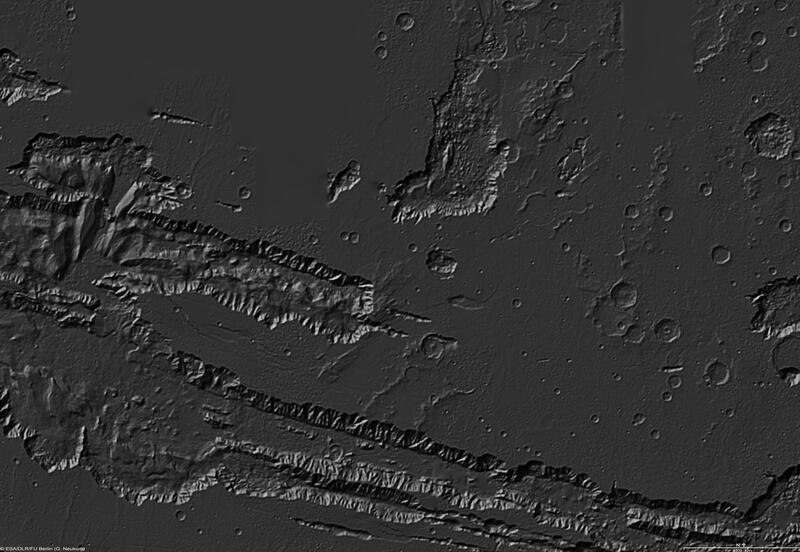 Additionally, for every HRSC image strip, individual terrain models with a map scale of up to 50 m were derived. In order to generate high resolution DTMs and ortho-images new exterior and interior orientation data based upon tie point matching and bundle adjustment have been used. The new orientation data refinements have been applied for individual and combined strips. It also helps planetary scientists to better interpret other data sets, for example the results of Mars Express's radar experiment, the Mars Advanced Radar for Subsurface and Ionosphere Sounding (MARSIS). “Once we know where the surface is, we can correctly interpret the radar echoes we get from below it,” says former ESA scientist Angelo Rossi, a member of the HRSC team. The Mars Express DTM is the most detailed topographic data set ever released for Mars. Its release has been made possible by processing individual image swaths taken by the HRSC as Mars Express sweeps through its orbit. The individual swaths are then put together into mosaics that cover large regions. The high-resolution images used have a resolution of 10 m/pixel. The DTM elevation data derived from these images is provided in pixels of up to 50 m, with a height accuracy of 10 m.
The orbit of Mars Express determines the resolution of its pictures. When it is closest to the surface, it can take the most detailed pictures. “As the mission continues, we are gradually filling in the gaps and taking high-resolution data whenever possible,” says Neukum. The team plans to add more data to the DTMs to extend the surface coverage as Mars Express continues its mission until at least 2009 and HRSC continues its unique scrutiny of the planet. 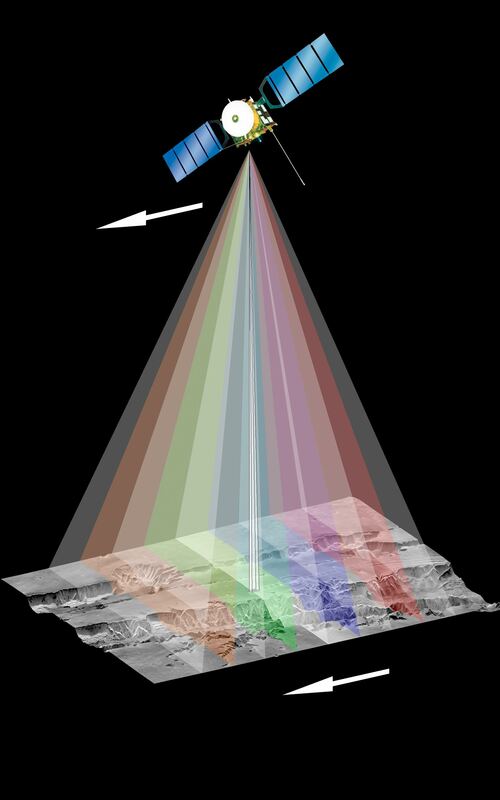 Constructing a Digital Terrain Model requires a spacecraft to look at the same surface feature twice, each time from a different angle. Most attempts to do this in the past have required the spacecraft to target the same feature from two different orbital passes. The High Resolution Stereo Camera (HRSC) on Mars Express is the only experiment that can do it in one pass. To achieve its complementary views, HRSC has nine individual scan lines that point fore, aft and straight down. It therefore sees a feature coming, sees it directly underneath and watches it recede into the distance, providing all the different angles needed. NASA's Mars Global Surveyor carried a laser altimeter instrument (MOLA) that provided spot heights across the surface of Mars but these were often separated by many kilometres. HRSC provides altitude data for every data point the camera sees. It is the first time that high-resolution images have been accompanied by high-resolution topography. The work of deriving new high-resolution archivable DTMs is split between DLR and FU Berlin. The systematic orbit-by-orbit processing of the DTMs is done entirely at DLR's Institute of Planetary Research, Berlin, which also runs the HRSC experiment for ESA�s Mars Express on behalf of, and in cooperation with, the PI and his team at the Institute of Geological Sciences, FU Berlin. 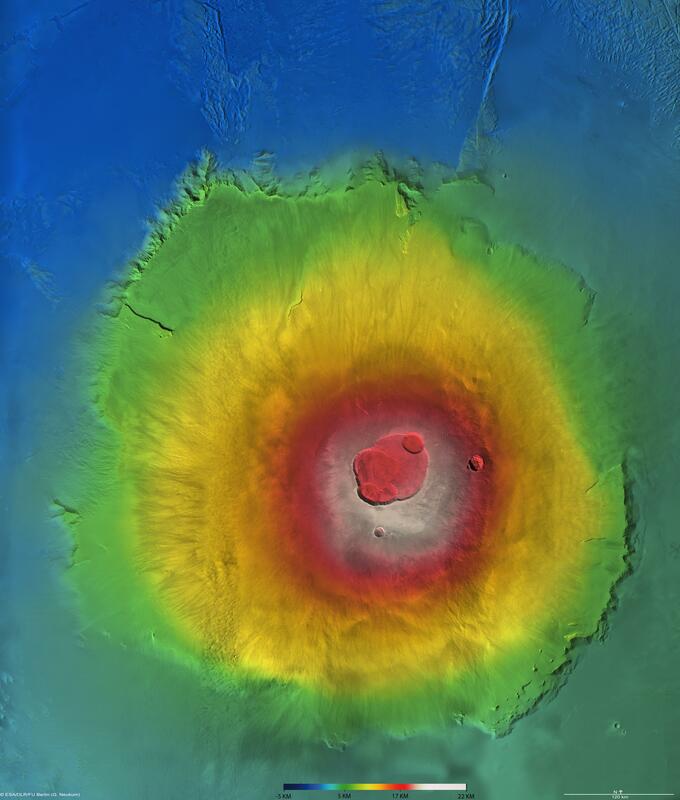 Mosaics of certain features on Mars, such as the Olympus Mons volcano are processed at FU Berlin using DTM data of individual strips and specialised software developed within the HRSC Co-Investigator Team. 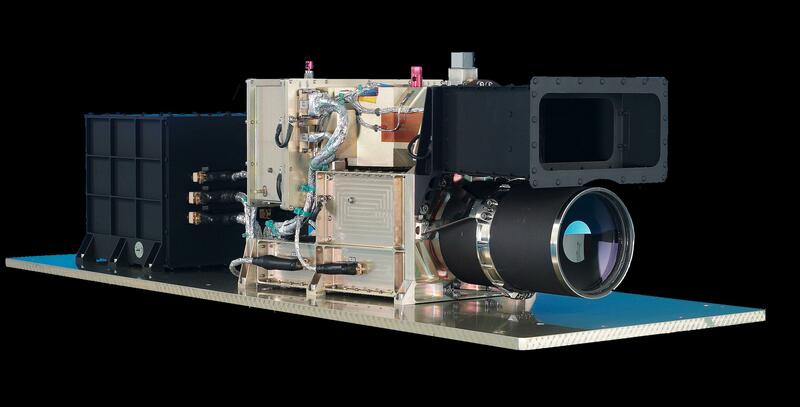 The additional funding required for the special processing of the individual image swaths and for the creation of the mosaics was provided by the German space agency (DLR), to the DLR Institute for Planetary Research and the Institute for Geological Sciences of the FU Berlin. DTMs had been processed in the past for exclusively scientific and outreach purposes, but with additional resources now available, it is possible to release the DTM data in higher quality. The Mars Express-HRSC DTMs are available to the science community at large through the archives at the Planetary Science Archive (http://www.rssd.esa.int/PSA) at ESA and the Planetary Data System (http://pds-geosciences.wustl.edu/missions/mars_express/hrsc.htm) at NASA. A joint website of FU Berlin and DLR provides the capability to the general public to visualize the data online (http://hrscview.fu-berlin.de).